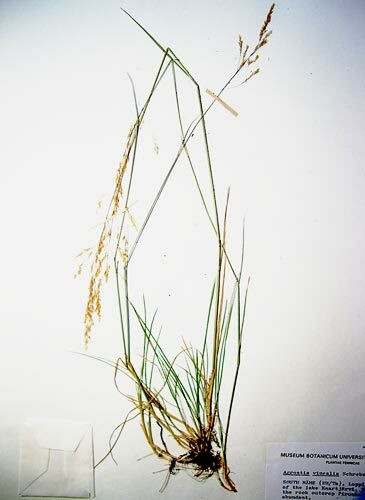 AgroAtlas - Relatives - Agrostis vinealis Schreb. - Brown Bent. Agrostis vinealis Schreb. - Brown Bent. Agrostis tenuifolia Bieb., A. syreistschikowii P.Smirn. Family Poaceae Benth. genus Agrostis L.
Perennial grass. Numerous culms 20-110 cm tall, less often few, with few cauline leaves. Rhizomes short, with thin rather short subterranean shoots. Leaves convolute setosely, 3-14 cm long, (0.5)1.5-4 mm wide. Radical leaves convolute, 0.5-1.5 mm diameter, greyish-green, long and thin-sharpened, subglabrous on both surfaces, less often weakly scabrous on lower (outer) surface. Ligule short, up to 2 mm long. Panicles 5-20 cm long, before and after flowering condensed or slightly lax, up to 5 cm wide, their branches directed obliquely upward and thin, more or less acutely scabrous almost entirely, rarely subglabrous in lower part. Spikelets 1.5-2.2(2.5) mm long, violet, fulvous-violet or pale green. Glumes about 2 mm long, equal or subequal, lower ones usually slightly longer than upper, acutely scabrous along most of keel, and covered with dense short spinules near apex. Lemma slightly shorter than glumes, 1.25-2 mm long, with more or less geniculate awn rising from the lower third of the lemma back, less often awnless; palea rudimentary. Anthers 0.8-1.3 mm long. Flowers in May - June. Anemophilous. 2n=14, 28. Forest-steppe and steppe zones of the European part of the former USSR, Caucasus, Northern Kazakhstan, West and East Siberia (up to Yenisei); Western Europe, North America (northeast). In steppes and forest-steppes, lower and middle montane zones on dry slopes, in damp subsaline and wet upland meadows, forest glades, steppified forests, sometimes thrives in fallows. Grossheim AA. 1939. Flora of Caucasus. 2nd ed. V.1. 402 p. (In Russian). Shelyag-Sosonko YuR., ed. Grasses of Ukraine. 1977. Kiev: Naukova Dumka. 518 p. (In Russian). Malyshev LI., Peshkova GA., ed. 1990. Flora of Siberia. V.4. Poaceae (Gramineae). Novosibirsk: Nauka. 361 p. (In Russian). Tzvelev NN. 1976. Grasses of the Soviet Union. Leningrad: Nauka. 788 p. (In Russian).